Ibrox Noise: Can Rangers midfield selection risk pay off long term? Can Rangers midfield selection risk pay off long term? As hinted at earlier, Steven Gerrard made quite a few unenforced (on top of the forced ones) alterations to the side last night, and perhaps one of the two most significant ones was the deployment of Steven Davis in a very unfamiliar role. 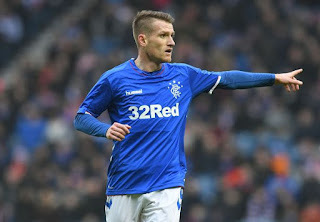 In theory Steven Davis as a deep-lying playmaker was a recipe for an ineffectual display, given how the former Fulham man has struggled with the pace of the Scottish game since his return and how he’d be harassed off the ball by pressing opponents. But instead, manager Steven Gerrard takes huge credit for doing an ‘Andrea Pirlo’ with Davis, albeit not quite on the same scale. As some readers may recall, we explained the position of ‘regista’, and how it was created by then-AC Milan manager Carlo Ancelotti to accommodate attacking midfielder Andrea Pirlo, signed from Inter, in a more defensive role. The idea of a creative spark but in a traditional inefficient position. And Gerrard did the same with normally attacking midfielder Davis – yes, he’s well-known for being able to play central midfielder too, but the defensive side of his game is not his forte. Ergo, the regista at Ibrox may have been born, and my word if it didn’t work a charm. Davis looked composed, assured, and raked the passes all night – he was able to use time and space to feed flanks and midfielders around him, and found himself using his best attributes in a way that allowed them to flourish. Regulars will know that while we’ve been harsh on Davis’ return to Ibrox (most have), one thing we’ve never criticised has been his passing ability and vision – its his big strength and his maturity and experience allowed him to thrive in the deeper role in front of defence, producing by far his best display since returning. Davis has definitely begun to motor after two or three months of spluttering, and having done it for his country too, this switch to DM has allowed him to do what he does best.